HOUSTON (KTRK) -- The FBI is asking for the public's help to identify a bank robber they say 'dressed up' before robbing a bank in east Houston last week. It happened on June 2 at around 11:30am at the 1st Convenience Bank inside a Kroger at 14710 Woodforest. 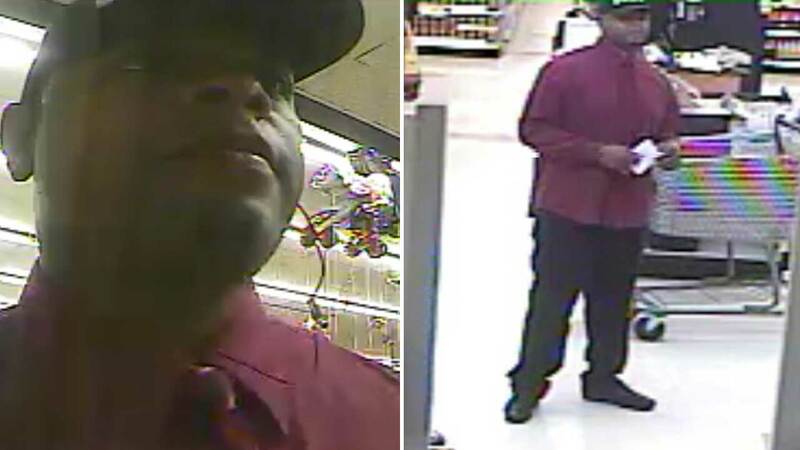 Surveillance photos from the bank show a man wearing a maroon dress shirt and tie. He reportedly handed the teller a threatening note and demanded $5,000 in cash. After receiving an undisclosed amount of money, they man fled. No one was hurt. The suspect was described as a Black male, about six feet tall, 180 to 200 pounds and about 30 to 35 years old. He dressed up for the robbery, wearing that maroon dress shirt, a maroon tie with white stripes and gray pants. He also wore a black baseball style hat with the words "STAFF" in bold white letters and had a blue tooth device around his neck. A reward of up to $5,000 is being offered for information leading to the charging and arrest of this suspect. If you have information about this case, please call the Crime Stoppers tip line at 713-222-TIPS (8477), or the Houston office of the FBI at 713-693-5000.